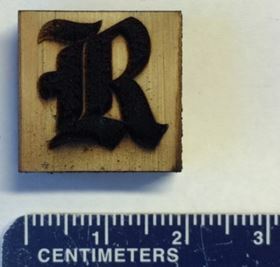 This Rice University athletics logo is made of laser-induced graphene on a block of pine. Image: Tour Group/Rice University. Scientists at Rice University have made wood into an electrical conductor by turning its surface into graphene. Rice chemist James Tour and his colleagues used a laser to blacken a thin film pattern onto a block of pine; this pattern is made from laser-induced graphene (LIG), a form of the atom-thin carbon material that was discovered at Rice in 2014. "It's a union of the archaic with the newest nanomaterial into a single composite structure," Tour said. He and his colleagues report this discovery in a paper in Advanced Materials. Previous iterations of LIG were made by heating the surface of a sheet of polyimide, an inexpensive plastic, with a laser. Whereas conventional graphene comprises a flat sheet of hexagonal carbon atoms, LIG is a foam of graphene sheets with one edge attached to the underlying surface and chemically active edges exposed to the air. In the same way that not just any polyimide would produce LIG, some woods are preferred over others, Tour said. The research team, led by Rice graduate students Ruquan Ye and Yieu Chyan, tried birch and oak, but found that pine's cross-linked lignocellulose structure made it better at producing high-quality graphene than woods with a lower lignin content. Lignin is the complex organic polymer that forms rigid cell walls in wood. Ye said that turning wood into graphene opens new avenues for the synthesis of LIG from non-polyimide materials. "For some applications, such as three-dimensional graphene printing, polyimide may not be an ideal substrate," he said. "In addition, wood is abundant and renewable." As with polyimide, the process takes place with a standard industrial laser at room temperature and pressure, and in an inert argon or hydrogen atmosphere. Without oxygen, heat from the laser doesn't burn the pine but instead transforms the surface into wrinkled flakes of graphene foam bound to the wood surface. Changing the laser power also changed the chemical composition and thermal stability of the resulting LIG. At 70% power, the laser produced the highest quality of what the scientists dubbed ‘P-LIG’, where the P stands for ‘pine’. The scientists took their discovery a step further by turning P-LIG into electrodes for splitting water into hydrogen and oxygen and supercapacitors for energy storage. For the former, they deposited layers of cobalt and phosphorus or nickel and iron onto P-LIG to make a pair of electrocatalysts with high surface areas that proved to be durable and effective. Depositing polyaniline onto P-LIG turned it into an energy-storing supercapacitor that had usable performance metrics. "There are more applications to explore," said Ye. "For example, we could use P-LIG in the integration of solar energy for photosynthesis. We believe this discovery will inspire scientists to think about how we could engineer the natural resources that surround us into better-functioning materials." Tour sees a more immediate environmental benefit from biodegradable electronics. "Graphene is a thin sheet of a naturally occurring mineral, graphite, so we would be sending it back to the ground from which it came along with the wood platform instead of to a landfill full of electronics parts." This story is adapted from material from Rice University, with editorial changes made by Materials Today. The views expressed in this article do not necessarily represent those of Elsevier. Link to original source. Scientists have used graphene to transfer intricate crystalline patterns from an underlying semiconductor wafer to a top layer of identical material. By sandwiching gallium and nitrogen atoms between layers of graphene and silicon carbide, scientists have produced 2D gallium nitride. A combination of C60, graphene and hexagonal boron nitride has similar properties to silicon but better chemical stability, lightness and flexibility.